Hell Fest features the perfect setting for a slasher, where monsters lurk round every corner waiting for unsuspecting victims to cross their paths. Of course, it’s all just for fun and no one is supposed to get hurt, but in Hell Fest, one man dons a mask of his own and preys on people he wants to truly petrify. With everyone thinking it’s all part of the act and under the guise of a member of staff, he is able to carry out violent attacks in plain sight. It’s a concept that has been covered frequently and Hell Fest doesn’t bring anything new to the slasher table. The characters are typical teenagers with very little death and it’s pretty obvious who’s going to make it to the end. It’d be wrong of me to tell you exactly what happens, but there are a couple of surprising early deaths that are grisly and creative. Plus, there’s an intense set piece that sees someone almost lose their head, so gore lovers will not be disappointed. Elsewhere, it’s reasonably fun to watch the teens wander the park and certainly prepare yourself for a few jump scares, but there’s something missing under the bright lights and the colourful glare. There’s very little substance and for all of director Gregory Plotkin’s (Paranormal Activity: The Ghost Dimension) clear love for the horror genre, Hell Fest falls into the trap of delivering very little than an homage. 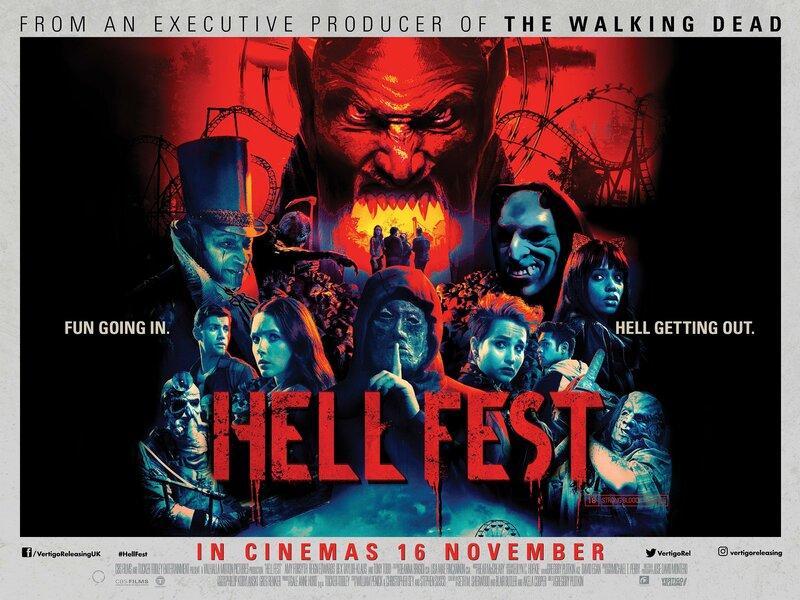 2018 has been such a strong year for horror and it is a shame that Hell Fest cannot join the ranks and is instead, resoundingly predictable, failing to be the standout slasher it had the potential to be. For all its bright lights and attractively retro visual style, Hell Fest can’t match the intensity or terror that is felt in the classic slashers it desires to replicate. Part of what made David Gordon Green’s recent Halloween so successful was the sense of journey from Michael Myers. Through long-takes and over-the-shoulder camera shots, we were given a sense of how Michael Myers made it to Laurie Strode’s doorstep and it added a credibility to the horror story. In Hell Fest we don’t get a feel of the killer’s whereabouts and, instead, he appears by magic everywhere our protagonists are. This would have been less irritating if the film hadn’t already established the idea of it being “regular” people who commit crimes on Halloween night. He’s not painted as an un-killable or supernatural Michael Myers or Jason Voorhees type, he’s a normal dude, so how does he manage to be everywhere and anywhere he wants? At its most simple Hell Fest should be a fun and brutal slasher flick, but unfortunately, the film fails to truly terrify and is instead a mostly formulaic and tiresome 90-minutes.